The exposition comprises 66 paintings by Maria Nelep (1929-2005). It is a new name for naive art appreciators. Exhibit organizers say Nelep’s work is in the same line with that of such world-famous masters of naive painting as Kateryna Bilokur, Hanna Shabatura, Nykyfor Drovniak, Ivan Heneralych, Niko Pirosmani, and others. Maria Nelep (nee Kosohon) was born to a large family in the village of Obukhiv, Kyiv oblast. She survived the 1933 and 1947 famines, worked hard at a kolkhoz and as a maidservant, and then was a construction site worker in Kyiv for 36 years. Unknown to the general public and tending the sick son, Maria worked inspiringly at her urban apartment, creating masterpieces of naive painting. Multi-aspect compositions flowed almost daily from her improvised paintbrush on plywood planks, glass, and cardboard. Flowers, rural houses, neat courtyards, churches, people, Obukhiv landscapes with characteristic hillocks, valleys, gullies, and rivulets are the subjects of her pictures full of particular sincerity, naivety, and emotional expressiveness. In her works, Nelep tried to say as much as possible about the important moments in her life and in the life of her fellow villagers, complementing images with ample captions-stories and thus creating sort of a chronicle of her native village. In the last years of her life, the master was cared for by employees at the National Center of Folk Culture “Ivan Honchar Museum.” They managed to preserve her artistic legacy and even a stock collection of Nelep’s works – more than 400 pictures! 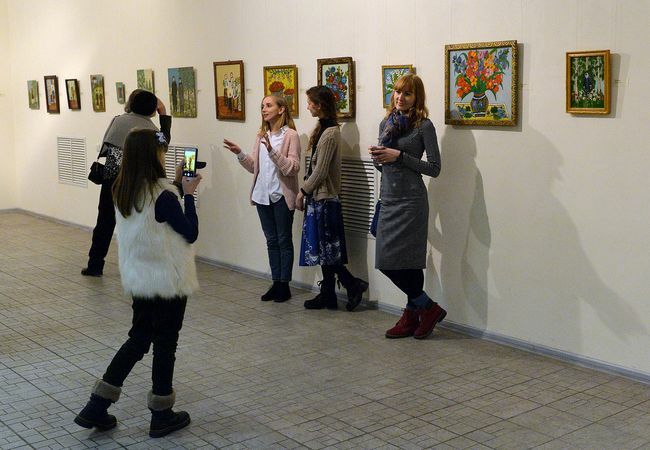 The artist’s unique legacy is being displayed for the first time in a museum gallery as part of the annual project “Naive April.” The exhibit is accompanied by an educational program – thematic lectures and excursions, interactive lessons for in-depth study of the particularities of naive art and revelation of the secrets of Nelep’s artistic phenomenon. “In my view, it is the purest art, without influence of any schools and names, which comes out of the artist’s heart. The pictures are an uncommon show of the history of Ukraine, and short captions under the drawings look like long stories,” Oleksandr Klymenko writes in Facebook, sharing his impressions of the exhibit. The exhibit will remain open until April 30.